As I cross the Bridge of Freedom -- Ponte della Libertà in Italian -- by train, I realise that this time I have come back to find refuge. Just for one day. I was a teenager when I first came to Venice; in six years I visited the enchanted city three times, eagerly exploring its many nooks and alleys, the calli, its round secluded squares called campi, but mostly won over by the dazzling beauty and grandeur of the Basilica of San Marco and the Palazzo dei Dogi. Poised between nostalgia for a glorious past and indolence, Venice is one of the most iconic and splendid cities in Italy and in the world. Forever still in the memory of its golden age, Venice has never moved on: and that is exactly what I find so fascinating and comforting about it. This time, I have come to listen to its stones and find their echoes in my soul. No cars, no advertisements. The city is divided in six areas, called sestieri. From Santa Croce, in the North East, I board a steamboat dangling along the Canal Grande, which cuts half through the historical centre. Again, the haunted houses along the Canale look over my passage in silence, like wonderful courtesans or rich matrons assessing a familiar stranger. The reflection of their sumptuous facades in the greenish waters of the Laguna is a hint at the venerable age behind their made up visage. The water, far from crystalline, is more open than the magnificent palaces in its revelation of Venetian moods and mysteries. I am running away from the tourist trails and all their overwhelming splendour: I disembark at the end of Canal Grande in San Marco, and hurry towards the oldest and biggest part of town, Castello, avoiding the famous Riva degli Schiavoni, the monumental promenade along the waterfront. I meander through a maze of inner alleys: my objective is to head off to the Isle of Saint Michael, between Venice and the Isle of Murano, which is famous for the craft of glass blowing. Since 1807 the Isle of Saint Michael has hosted the Venetian cemetery. The eerie softness of the graveyard on the sea is the ideal place to rest and spend a few hours at peace. 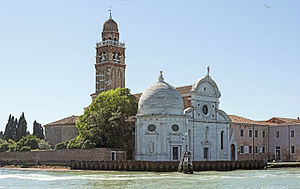 Here is the first Renaissance church built in Venice, dedicated to Saint Michael. As I linger before the white façade of Saint Michael’s, I feel a light tapping on my shoulder. I turn around. A long-haired blond man in its thirties smiles, dimples form in his cheeks. “You look lost,” he says. I shake my head, he stretches his arm and offers me his hand. I shake it. Bruno is his name and he is an Austrian painter. He offers to show me the church and its Cappella Emiliana, which, he adds, according to John Ruskin, is nothing special. “No need to apologise,” I say with some embarrassment. There is something open and friendly in his voice. I yield. Bruno fetches his tools and his easel, which, I now realise, is leaning against the side wall of the church. We head towards Saint Michael’s stern but reassuring statue. The archangel looks majestic and protective. I am standing there, with Saint Michael at my back, watching over this strange encounter. Time slows down. As Bruno works, I let go of my expectations of a perfect day of solitude. Maybe this is meant to be different. My portrait is enigmatic, the light waves ripple on my auburn hair, Saint Michael’s towers at the back: the mood of the painting and my eyes slanting sideways in the meridian light capture my dreaminess and relaxation. Bruno leaves the canvas leaning against the statue’s plinth and invites me for a stroll in the Sleeping Gardens, a poetic name for the cemetery. He tells me the church and the cloister were built between 1496 and 1533, but it is the cemetery, with its many gravel paths and graves of illustrious artists and poets, that really warms his heart. Across the arches carved in the red brick walls surrounding the cemetery, the sea ebbs and flows in the wind. It is blue and alive, quite different from the still greenish waters of the Lagoon. Life and death, stillness and movement intertwine here. As the conversation unfolds, I take in the high cypresses, their delicate scent and the tombstones and crosses dotting the green meadow. Flowers are everywhere, as well as pictures of the dead, many in black and white. The island of memory, the city of the dead, the sleeping garden: we pause before the monumental tomb of a sleeping maiden. Except for the restless sea, there is silence all around. From time to time the occasional seagull’s shrill voice turns into a sigh when the wind takes over. It is blowing from the North: a cold, crisp wind on a bright day in the middle of September. A luminous day. The stark strangeness and astounding unpredictability of these moments of otherness move me. I am talking about life and death, hope and disillusion, permanence and impermanence with a total stranger and yet, it is all so natural and feels as if Bruno and I have been friends for ages: as if an occult pull brought us here today from our different lives in distant places. There are legends associated to this graveyard. He tells me about empty tombs: of a nun who died as a saint, and of a girl who was buried here after a shipwreck. Their bodies were never found. I ponder on the meaning of such stories: does it matter what happens to our bodies when we die? If yes, to whom? Maybe we need such stories to nurture our hope and our sense of the numinous, of a thin thread that connects us to the mystery of being born and having to die, and of the unknown beyond. This graveyard is saturated with the sense of a community carrying on through the centuries, keeping the very city of Venice alive and cohesive through its memory. In a society that either exorcises or sensationalises death, visiting this sleeping garden feels special. I realise I am in a thin place, where sea and sky meet and lull their sons and daughters – not only the dead, but also the living – into peace and remembrance, weaving a web of all the strands that make us human and worthy of everlasting love. We watch the twilight gradually spread throughout the sky: violet and golden hues paint the horizon, as a few pink clouds rise like inflated balloons. Not far away the evening star is shining with pride. As we reach the gate of the graveyard, we hug in silence. “Thank you,” we whisper. We exchange e-mail addresses, but maybe we won’t write. Bruno says he is bad at keeping contact. It is time to part. We are going different ways. Yet, I won’t forget this afternoon under Saint Michael’s wings with quiet, friendly Bruno. And I know he won’t forget it either. What is it that turns strangers into our soul companions, capable of sharing our innermost thoughts without veils, I ask myself. In the steamboat on my way to the seventeenth century Villa in the Dorsoduro area – where I booked a room – I hold my canvas, which Bruno wrapped with care in an inconspicuous sheet of brown paper. Poised between the end of the day and the beginning of the night, Venice looks innocent and pristine for the first time, as if suddenly turned into an adolescent girl shivering in the evening breeze, full of trepidation and anticipation for what is to come. Its domes, palaces and churches project their long shadows on the Lagoon. After a polite welcome, the concierge hands over the key to me. I take the lift to the upper floor, where my room is located. I turn the key in the latch and, as I switch on the light, I get rid of my rucksack. The room is elegant, but simple. No overwrought patterns here; a soft cream colour makes the ambience warm and welcoming. I uncover my canvas, place it on the desk and watch my portrait glow, as I sink in the velvet armchair. Tonight I just close my eyes and see with my inner eye: the marble statues of angels and children and girls in the Cemetery of Saint Michael take on life, they nod and whisper and smile… In yet unknown ways, I feel this day will bear its fruits of understanding and depth. In my thoughts I thank the Unknown, and the spirit of Venice, city of one thousand masks and wonders, for the unique gift of insight and sheer delight it bestowed on me, just when I needed replenishment.